How fun! 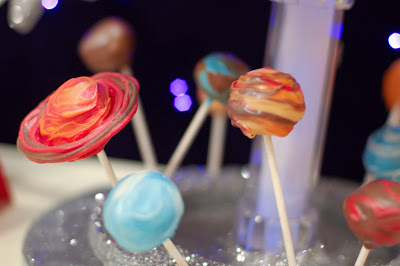 We have a space-themed party coming up at my son's school and these will be perfect! ooooo! My son's 1st birthday is quickly approaching and I wanted to make cake ball planets but was searching around for a recipe that wasn't actually a cake ball (sorry but mushing cake crumbs with frosting into a ball sounds gross to me). I'm ttly going to try this instead! Iv'e never had wheat germ before....so I hope it's yummy. Your planets look amazing! love how you decorated this with candy chocolates. I already made my planets out of rice crispy treats covered in fondant but didn't know how to color them. I'm totally going to do this and we'll see how it turns out. This will be added to the solar system cake I'm making for my son's 11th bday this weekend.. Thanks for sharing this! My pleasure, Lynn! The blog has moved over to Tikkido.com, so join us over there for all the fun new content. I'd love to see a photo of the solar system cake! What a cool concept.